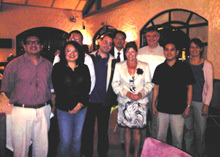 A delegation of German parliamentarians who are members of the Bundestag Committee for Economic Cooperation and Development was in the Philippines on August 26 to 31, 2011. The visit followed shortly after Deputy Foreign Minister Werner Hoyer came to Manila on August 4 to 6. The arrivals of Germany’s important leaders in the country signal that the Philippines is starting to attract the attention of Europe’s largest economy. One member of the delegation was Helga Daub of the Free Democratic Party (FDP). The group visited Mindanao as part of its program. Asked if the trip to southern Philippines was to explore how Germany could assist in building peace in Mindanao, Daub had more to say: “We came not only for that reason. We also want to help in terms of education, health care and poverty alleviation.” Daub, who is a development expert, has lobbied for similar issues in Germany. FDP, who is in coalition with the government, recently passed the Medical Care Structure Law that ensures the presence of doctors in rural areas. The Friedrich Naumann Foundation for Liberty (FNF) Philippine Office that is connected with the FDP, hosted a meeting with liberal partners for Daub. Political Affairs Undersecretary Chito Gascon, Ateneo Human Rights Center Acting Executive Director Arpee Santiago, and Philippine Economic Society Vice President Peter U briefed Daub on the developments in the Philippines under a liberal government. There may be areas for improvement but there remained optimism especially with President Aquino’s platform of good governance. “The meeting was very valuable. It is important not only to read news on papers but to hear stories from real people. The FNF partners made me understand the political, social, and economic situation in the Philippines,” said Daub. The delegation was also scheduled to meet with Secretary Leila de Lima of the Department of Justice and visit a juvenile prison. “The Philippines is becoming a central country in Southeast Asia. The world is starting to see the potentials of the Philippines and this is because of an honest government,” expressed Jules Maaten, FNF Philippines Country Director.